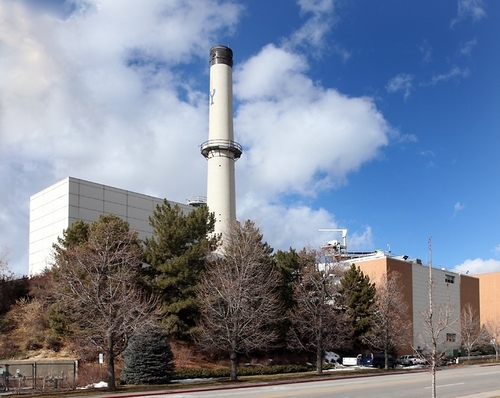 The BYU Central Utilities Plant is located at South-East corner of campus, to the side of the Clyde and Crabtree buildings. 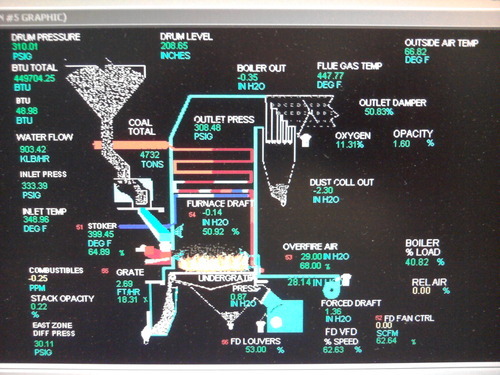 Many visitors confuse the heating and cooling plant with a power plant because of the smokestack and cooling towers. However, no electricity is generated at the heating plant . 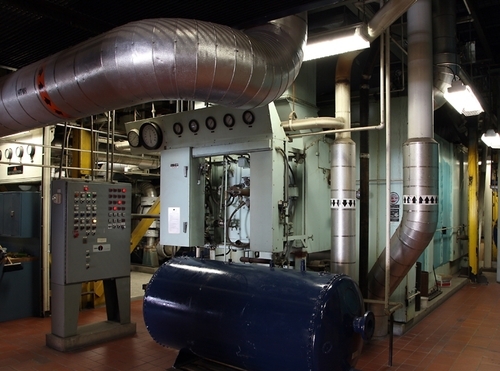 During the summer the heating plant provides cooling to all of the buildings on campus. It does this by using coal as a fuel through a process called absorption cooling. Absorption cooling uses a heat source, in this case coal, to provide the energy needed to drive the cooling system. Absorption coolers are a popular alternative to regular compressor refrigerators where electricity is unreliable, costly, or unavailable, where noise from the compressor is problematic, or where surplus heat is available (e.g., from turbine exhausts or industrial processes, or from solar plants). Both absorption coolers and compressor refrigerators use a refrigerant with a very low boiling point (less than 0 °F/-18 °C). In both types, when this refrigerant evaporates (boils), it takes some heat away with it, providing the cooling effect. The main difference between the two types is the way the refrigerant is changed from a gas back into a liquid so that the cycle can repeat. An absorption refrigerator changes the gas back into a liquid using a different method that needs only heat, and has no moving parts. The other difference between the two types is the refrigerant used. Compressor refrigerators typically use an HCFC or HFC, while absorption refrigerators typically use ammonia, water . 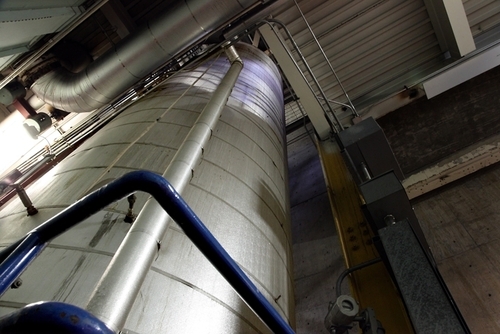 The refrigeration cycle at the BYU heating plant is a Lithium Bromide / Water system. The system cools by boiling water at a low pressure. The water vapor is absorbed into the lithium bromide solution and expelled through the heat from the coal . 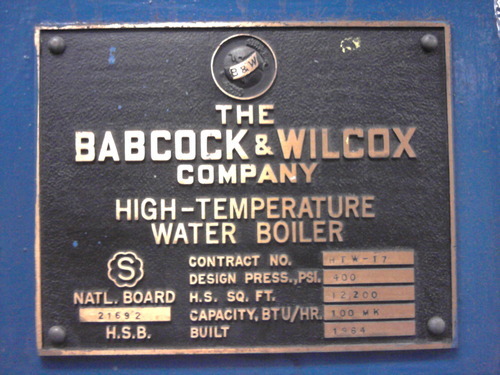 The newest boiler has a capacity of 100MBTU/hr and was built in 1964. The faceplate on process equipment gives a description of the design specifications, information about the manufacturer, and construction date. The boiler is controlled by a distributed control system provided by ABB. The schematic allows the operator to view the measurements and alarms inside a control room, away from the process equipment. The operator can also make adjustments from this screen if the automatic controls are not functioning properly or during start-up or shut-down. Inside the boiler, the coal is conveyed along a moving grate where it combusts to heat the water to 400 degF. This heated water is used as the heat source for the absorption coolers in the building next to the boilers.